Waxy Maize has been a controversial topic, much like creatine, with plenty of folks looking at what Waxy Maize doesn’t do rather than what it does. In this review, we will look at why Waxy Maize is a superior carb source. 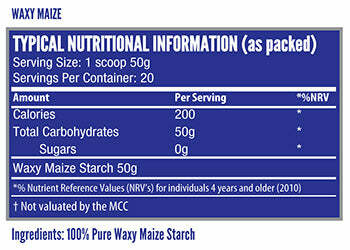 Waxy Maize is a carb source derived from corn, more specifically, corn starch, but it is not just corn starch. I have heard plenty of claims that you can simply just add corn starch (Maizena) to your whey shakes or to your BCAAs and get the same effects. DO NOT add Maizena to your supplements, you will cause serious gastric distress. Waxy Maize is a refined, long-chained starch molecule mostly comprising amylopectin, a water-soluble starch component. Corn starch will lead to bloating, stomach cramps, and other gastrointestinal complications, but most of all you will not absorb the nutrients your body needs. However, corn starch is a great carbohydrate source because it is a simple monosaccharide glucose molecule. Why Waxy Maize then? Waxy Maize is a fast-absorbing carb source with an extremely high molecular weight, which improves digestion rates and eases gastrointestinal distress. Molecular weight is pretty much what it sounds like, it is the mass of one mole of substance calculable off of the atomic weight of a substance. The higher the molecular weight of a substance, the longer it can stretch before it ruptures. Once a substance has ruptured, it cannot be used, therefore, Waxy Maize can be stretched further on a molecular level before it loses its integrity. This results in Waxy Maize extending its release time, giving your body a greater chance of utilising each molecule more effectively. Simply put, Waxy Maize yields a greater carbohydrate absorption rate without leading to bloating, stomach cramps, or other gastrointestinal issues. This greater absorption rate also extends to other compounds as well, such as creatine, nitric oxide boosters, as well as other cell volumisation agents, improving the digestion rates of these compounds when combined with Waxy Maize. Consuming Waxy Maize during your workout helps provide rapid energy, minimize fatigue, maintains peak performance levels, acts as an anti-catabolic and keeps the muscles feeling full. Amplify’s Waxy Maize is the ultimate solution when you are looking for a good-quality fast-absorbing carbohydrate source. It is a standalone product making it easy to add to any of your favourite supplements, as well as giving you full control over the number of carbs you are taking in. Some products already have Waxy Maize added in, but if you want to tweak and fine-tune your nutrient profiles to tailor them to your exact needs, then Amplify’s Waxy Maize is the best way to achieve that. Amplify Waxy Maize retails for R199 for a 1kg tub. A single serving size is 50g, and there are 20 servings per tub, making a single serving cost R9,95. I prefer a carbohydrate source separate to my other supplements because I love that ability to fine tune my carb intake. Some days I feel flat so I can add more, other days I feel full enough that I don’t as many carbs while I train. Also, I prefer Waxy Maize over Dextrose and Maltodextrin because I can feel that it sits comfortably in my gut, keeping my waist and stomach trim, while still fuelling me throughout my training. Amplify Waxy Maize is my preferred carb source. I add it to my BCAAs while I train, and post-workout with my whey protein for a mass builder-esque shake. It is slightly more expensive than other simple carb sources but it is well worth the extra money. Supplementing with Waxy Maize helps optimize glycogen energy storage, increases hydration ad promotes increased muscularity. It can be used pre, intra and post-training or during competitions to give you an edge.